Tracker Software Products :: Knowledge Base :: Can I use PDF-XChange Viewer to merge PDF files? 1. Open one of the files to be merged. 2. Click Document in the Menu Toolbar. 4. 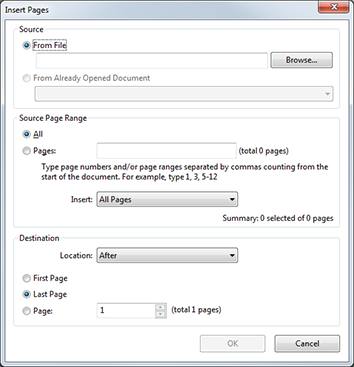 Select a file, determine the page range used and destination location, then click OK to insert. Please note that PDF-XChange Editor has now superseded PDF-XChange Viewer, which has been discontinued. PDF-XChange Editor features many more customizable options for merging documents than those detailed above. See here for further information. If you need to batch-convert multiple files then PDF-Tools is the best option. See here for futher information.